Clayne Crawford, like many other actors in Hollywood, is living a blessed life with his wife Sunshine Kiki Brown. Though the couple shares pretty little information about their family life and kids in media, their relationship has taught us a wonderful lesson. 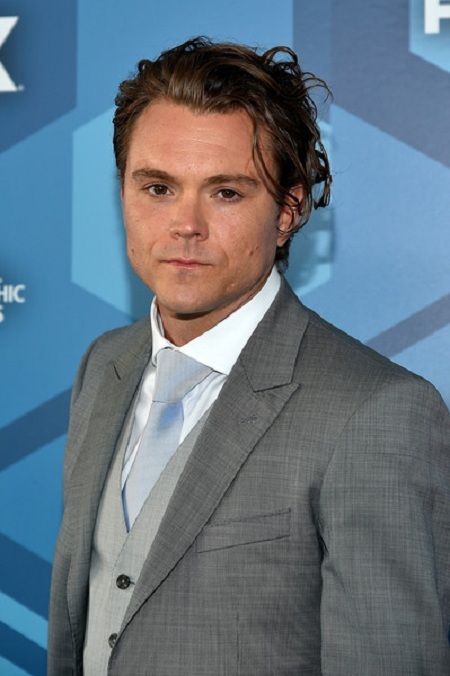 Clayne Crawford, the 39-year-old actor like many other Hollywood celebrities, is living a blissful life with his longtime wife Sunshine Kiki Brown. Though the couple shares little information about their family life and kids in media, their relationship has taught us a wonderful lesson. For more details about his personal life, keep reading! Clayne Crawford is living a happy married life with wife Sunshine Kiki Brown. Sources reported that the two tied the knot in 2004 and are living happily together ever since. Though the pair hasn't revealed much about their romantic relationship in interviews, they are quite open on social media. They have been together for 14 years and we don't hear any rumors about their divorce or extra affairs. And this special Lady - HAPPY MOTHER'S DAY!!! Thank you for keeping this circus on the tracks. We love you!! Looking at Crawford's recent Instagram posts, we can assure that the two are still going strong. The heartthrob shared a passionate kiss with his lovely wife in a post of December 2017 wishing her 'Happy Birthday'. They enjoyed a romantic date in France on a happy occasion. Father of two handsome boys! Crawford and Brown have two children together; Joey Crawford and Colt Crawford. Before her marriage to Crawford, she was in a relationship with another man. She also welcomed a daughter Abby Brown with him. Later, Crawford fathered her daughter Abby Brown. It's very difficult to get into one's personal life when the star is secretive about his/her life. Though he's living a blessed life with Brown now, he was romantically linked with actress Sunny Mabrey in early 2000s. Sources say that the two were one of the hottest topics in media. Crawford and Mabrey got engaged in 2002 but they didn't marry. Now, Sunny is in a relationship with 38-year-old actor Ethan Phillan. Similar: Fast And Furious Actress Jordana Brewster Married to Producer Husband Andrew Form Since 2007; Parent Of Two Children; How It All Began For The Power Couple? Crawford also dated Angie Cole for a few months in 2006. Crawford who played the role of Martin Riggs in the Fox TV series Lethal Weapon was fired from the series on 8th May 2018; all because of his abusive behavior on the set. Fox renewed the series with the third season with actor Seann William Scott opposite of Damon Wayans. Scott is playing the role of his brother thus keeping Martin Riggs alive. As per some reliable sources, he was warned several times about his poor behavior. Despite repeated warnings, the actor never changed his conduct. As Lethal Weapon has a huge prestige both domestically and worldwide, Warners finally came with the decision to detach Crawford from the show. Some days later his departure, he took Instagram and congratulated the cast and crew for the third season. Most importantly, he apologized for what he did on the set. Crawford apologized for all his mistakes back in April 2018. He mentioned two incidents that ultimately led to his firing. The first incident occurred when he outbursted on the unsafe working conditions on the set. The second incident happened during an episode when another actor felt unsafe being hit by a shrapnel. Born on 20 April 1978 in Clay, Alabama to the family of Brian and Lennie Crawford. He was in the football and wrestling team in his high school. He completed his graduation from Hewitt-Trussville High School. He is best known for his roles in A Love Song for Bobby Long and The Great Raid. In 2010, he played the role of Kelvin Wade, a young mysterious man in 24. Also played as Martin Riggs in the Fox Television Lethal Weapon. He has around 64.4k followers on Twitter and 197.2k followers on Instagram.